It was a wonderful morning we had multiple gobblers piping up off the roost. They hit the ground and stopped talking as I expected. I told him we'll just hang out for a few minutes and we both agreed to work our way around the back to where we thought they were headed. We snuck about a quarter of that distance and I heard a whisper. He spotted them up ahead. They were just entering the field we were headed to. I told him to sit right where he was and get ready. I lay flat on my stomach and hit the call and they started gobbling. There were no trees close by to get hunkered into, Dutchie was sitting against a sapling. I worked the birds for about 5 minutes and they like what I was saying because they headed our way gobbling every five steps until I heard a boom! I looked over 10 feet to my right to see a big smile "stone dead" he says. I started purring and cutting hard and the other birds started taking cheap shots at the dead bird as they do while establishing pecking order. I hear Dutchie whisper "take the gun" I am saying no man it's ok, before I know it. It's comes sliding across the ground in front of me. Well you can't put a gun in front of me like that and not expect me to pull the trigger. I couldn't resist. I snuck his new Browning Maxus up to my shoulder laying prone and kept a slow cluck and purr going until I could see a head. 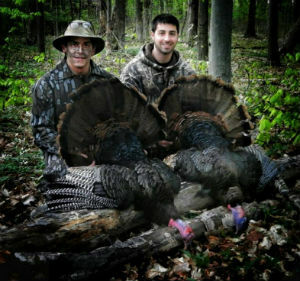 Long story short, we hammered two birds with one gun on a beautiful spring morning.